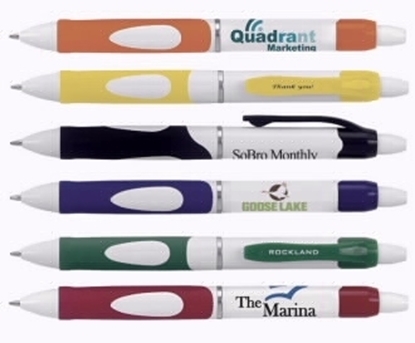 Clients will always be in good "spirits" when your campaign includes the Spirit pen! 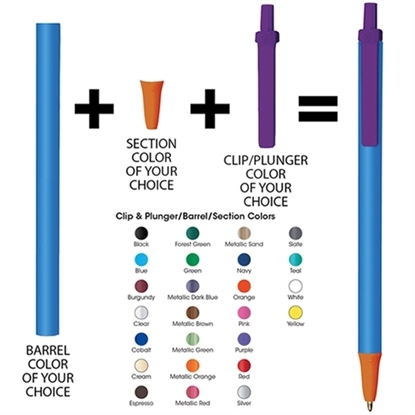 Featuring a white barrel with grip section, this click-action pen with clip features colorful accent trim colors, a plunger-action mechanism and medium point with black or blue ink. Black ink is provided unless specified. Measuring 5 5/8" L x 7/16" D, this giveaway is a wonderful way to promote your brand at a great price. Have your logo or message imprinted now! 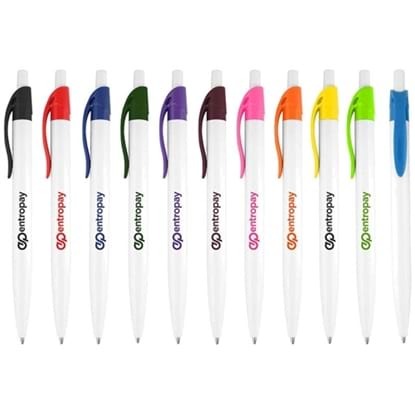 Click pen with lots of options and bold colors. Any color combination of: White, Black, Blue, Green, Red, Yellow, Orange, Maroon, Purple, Navy Blue, Dark Green for Barrel and Clips & Trims. When choosing options, color of product indicates barrel color and color of trim indicates trim colors. If choosing an assortment, must specify color assortments and quantity in comments. (Minimum quantities may be required, for each color combination). Always in stock. FREE set-up. Ventilated cap design. Full-imprint customization. Stock art backgrounds available. White Barrel with Black, Blue and Red Trims and Clips. Eye catching, slant top clicker. 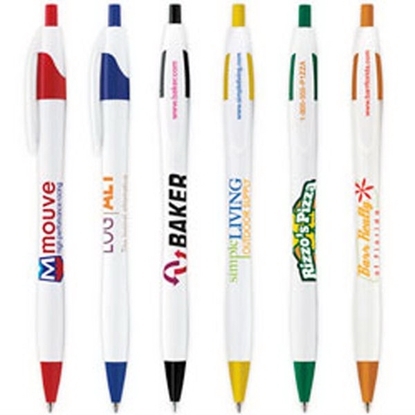 Enthusiasm for your brand never "cools" when your campaign includes the Chiller pen! 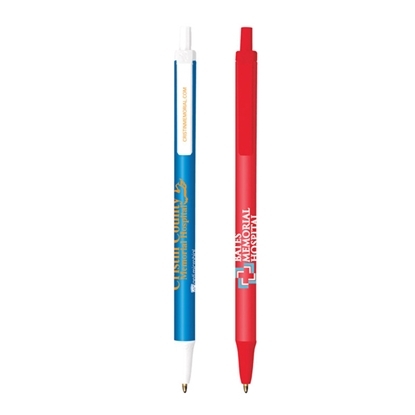 Featuring a frosty barrel with cool, new, contrasting colors, this eye-catching ballpoint pen with a clip has a grip, plunger-action mechanism and black or blue ink with a medium point. Black ink will be provided unless specified. Measuring 5 5/8" L x 3/8" D, this giveaway is perfect for any event. 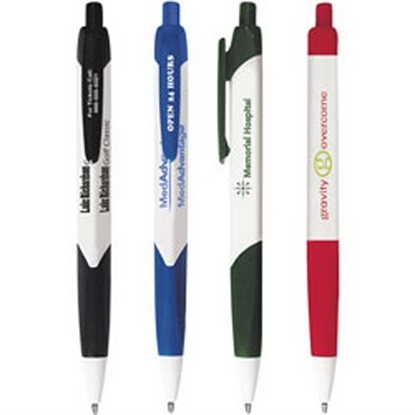 Have your logo or message imprinted on yours. Order now! Translucent Neon Blue, Green and Purple Barrels with Black Trims & Clips. Always in stock. Popular solid colors. Stylish cap action-retractable. Clip imprint available. Choose barrel color and trim color in product options. Multi-color imprint available. (Please call or chat for pricing). If at first you don't succeed, "tri, tri" again with the Tri-Grip ballpoint pen! 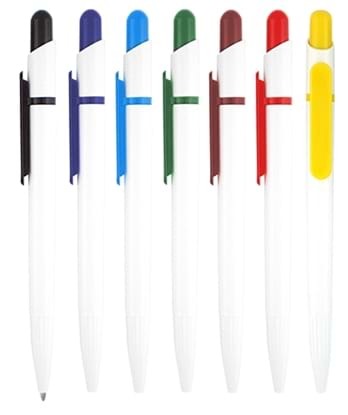 Featuring an appealing, triangular-shaped white barrel, color accent clip and grip section, this plunger-action ballpoint pen measures 5 7/16" L x 15/32" D and has a medium point with black ink. Blue ink is available in the blue-trimmed pen only. Black ink is provided unless otherwise specified. 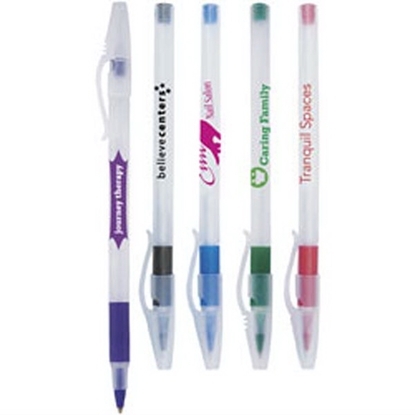 Get more bang for your buck with your imprint on this three-sided pen! Always in stock. FREE set-up. 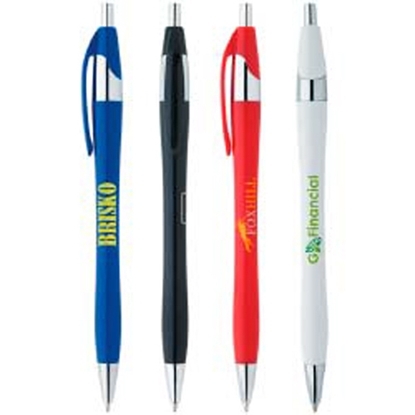 BIC(R) AZ-Antimicrobial protects the pen by suppressing growth on the pen of bacteria, algae, fungus, mold and mildew. Break-resistant pocket clip. 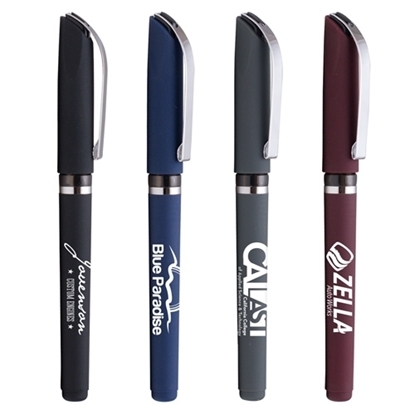 Dive right into your next campaign and make a huge "splash" with this promotional pen! 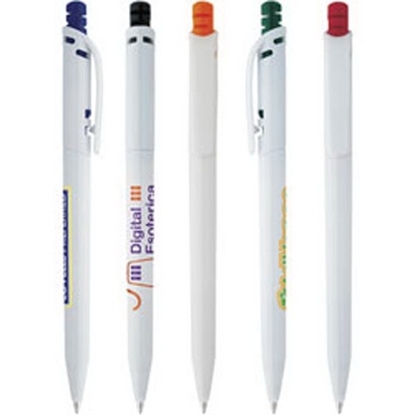 Featuring a white barrel with coordinating grip and clip colors, this eye-catching ballpoint pen measures 5 11/16" L x 1/2" D, and has a medium point with black or blue ink. Black ink will be provided unless specified. Unless otherwise stated on your order, we will choose the imprint location for best appearances. A plastic cap-off pen with the elegant look of a high-end metal pen, the Riverside Softy is sure to please. 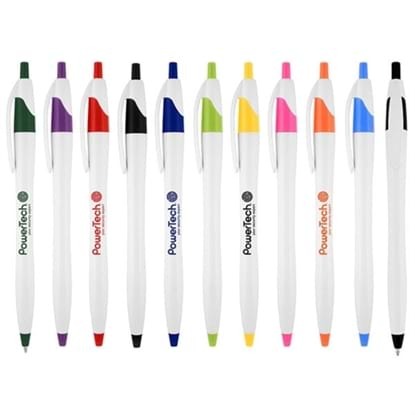 This is a fine point, smooth-gliding gel pen with a comfortable, rubberized soft touch finish. Writes smooth, feels smooth, and looks great. 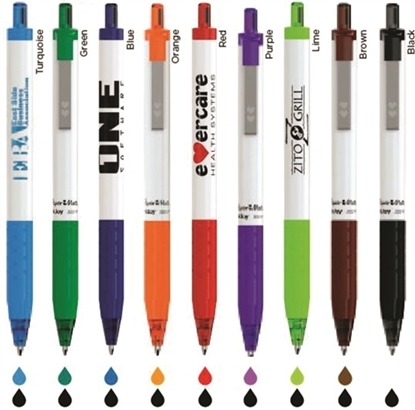 Select from a variety of barrel colors to customize with your imprint. 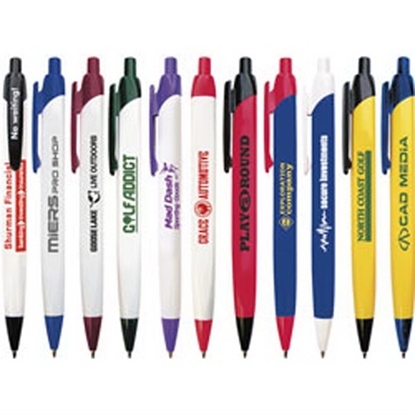 The Bic WideBody Pen is one of our favorite promotional pens. 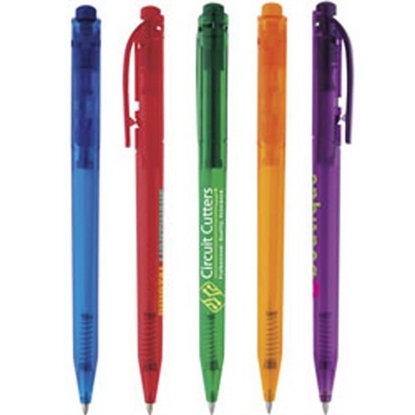 Popular click pen, with Bic quality. Widebody offers comfortable writing. Smooth ballpoint ink. Multi-color imprint barrel with clip imprint as another option. Large imprint area. 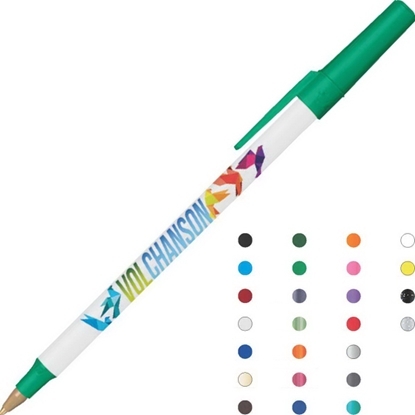 Many ways to display your message on this pen. Assembled in the U.S.A. Over 300 possible color combinations. 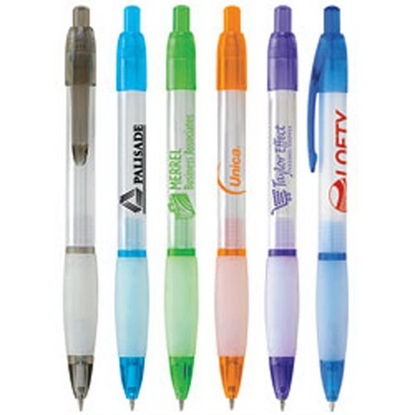 Mypromotionalpens.com offers the largest and best priced selection in Promotional Blue Ink Pens. We will price compete and we won't be under sold. 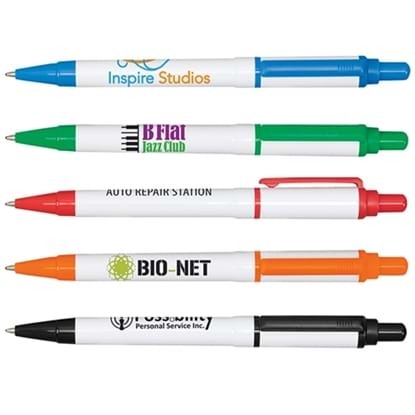 Let our graphic designers make your personalized Blue Ink Pens standout above the crowd at no charge. We won't stop until you are completely satisfied with your custom Blue Ink Pens art proof.Use category search filters on your left to help narrow your search to find exactly what you are looking for.